In-depth CRM analytics to help you make smarter business decisions. From lead analytics to deal insights, activity stats, and email analytics, monitor every aspect of your sales cycle any?time, anywhere with pre-defined dashboard views. 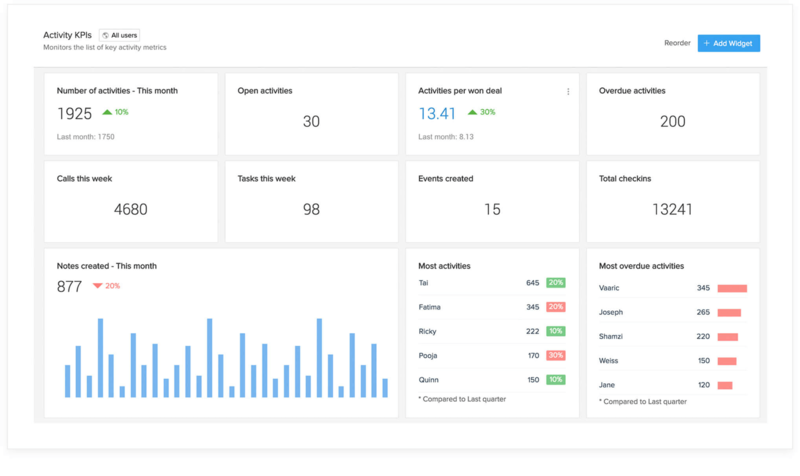 Create customized dashboards with sales analytical widgets,?such as charts, target meters, KPIs,?and?funnels. ?Make informed decisions, and start celebrating sales success with actionable data intelligence. Chart your way to success. 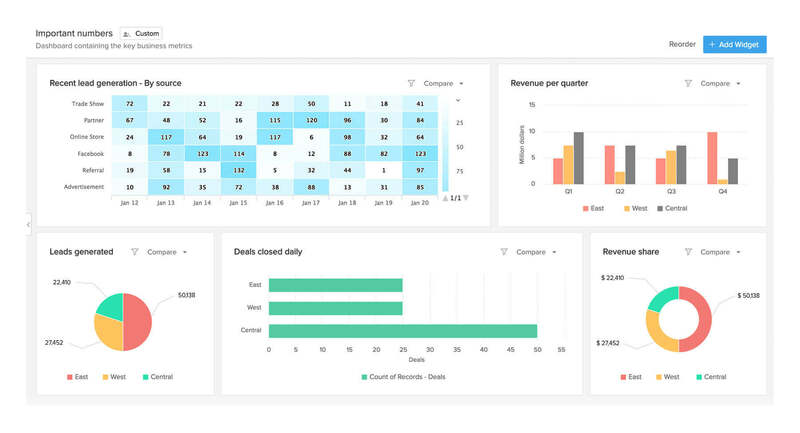 From pie charts to heat maps, start seeing your everyday sales metrics in the most visually engaging way. ?Bypass the hassle?of?analyzing huge volumes of data with a simple, visual representation of your CRM data. With a range of chart styles to choose from, you can create a chart from an existing report, or create one instantly?without the need to select a report.? Know where your business stands.? You shouldn't have to manually?track?the?increase and decrease of?individual sales parameters, such as number of leads created per month, the number of deals closed daily, etc. Our?AI-powered Anomaly?Detector?widget?compares?your actual sales performance with the predicted trend, and lets you know where there was a deviation from the projected sales pattern. 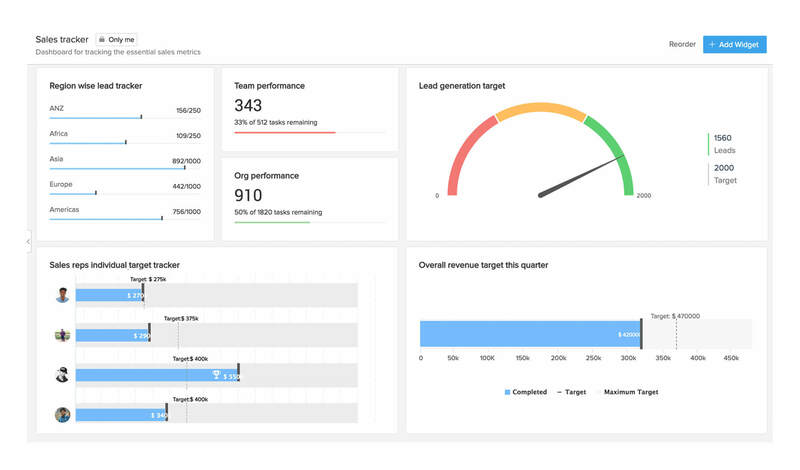 From a scorecard that follows top deals to a dashboard that monitors current growth indices,?Zoho?CRM's?KPIs give you a complete picture of the essential sales figures, so that your team can identify and concentrate on the areas that need improvement.? Compare a variety of metrics across multiple modules, such as users,?teams, roles, territories, etc. Create a?comparison table, weigh in on a range of parameters, and look at how the metrics fare against each other.? Break sales records?without?breaking a sweat. Turn your organization's objectives into achievable targets. Assign and monitor targets to know where you stand. Customize your target meter the way you want it to be: a dial gauge, a bar chart, a watch list, and more. Stay in control of your sales pipeline. Analyze every sales activity, and track the numbers at every stage of your sales pipeline. Create funnels for those metrics that matter and know when there is a significant drop or rise in your sales pipeline. 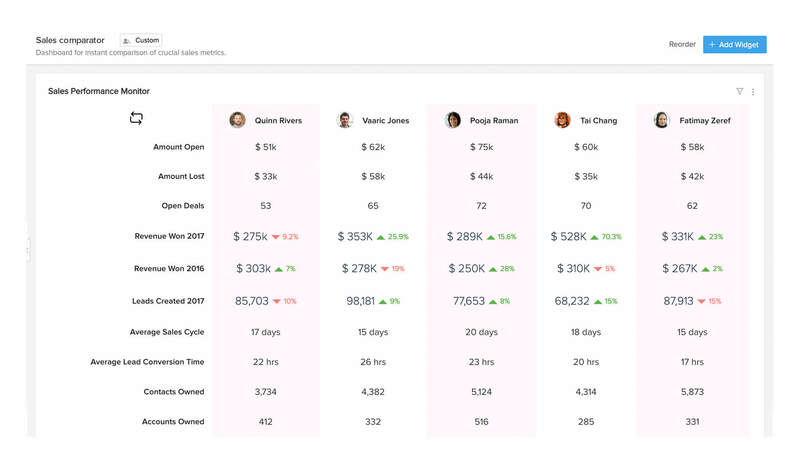 With funnels, see your conversion rates, identify where the potentials churn the most, and measure the overall efficiency of your sales process.